X It quickly scales even vertical walls. It senses humidity with its tail to predict the next day’s weather. X Es klettert blitzschnell Wände empor. Mit seinem Schwanz misst es die Luftfeuchtigkeit, um das Wetter am nächsten Tag vorherzusagen. X Arcko peut grimper aux murs à l’aide de ses pattes. Grâce à sa queue, il est capable de mesurer l’humidité de l’air et de prédire le temps du jour suivant. X Escala superficies verticales muy rápido. Con la cola detecta la humedad y prevé el tiempo que va a hacer. X Riesce a scalare rapidamente anche pareti verticali. Rileva l’umidità attraverso la coda per prevedere il tempo dell’indomani. X 수직으로 된 벽도 쭉쭉 타고 올라간다. 꼬리로 공기 중의 습도를 감지해서 내일 날씨를 맞힌다. Y Dank seiner mit winzigen Stacheln besetzten Sohlen haftet es sogar kopfüber an Wänden und Decken. Y Les épines de ses plantes de pieds lui permettent de marcher aux murs et au plafond sans tomber. Y Tiene pequeñas púas en las plantas de los pies que le permiten andar por techos y paredes sin caerse. Y Le piante dei suoi piedi sono piene di uncini che gli permettono di camminare su muri e soffitti. Y 발바닥의 작은 가시가 벽이나 천장에 걸리므로 거꾸로 매달려도 떨어지지 않는다. 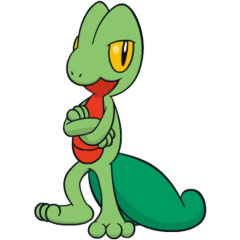 Omega Ruby Treecko is cool, calm, and collected—it never panics under any situation. If a bigger foe were to glare at this Pokémon, it would glare right back without conceding an inch of ground. Omega Ruby Geckarbor ist ruhig und beherrscht, es gerät niemals in Panik. Wenn es ein stärkerer Feind zornig anstarrt, erwidert es den bösen Blick, weicht aber keinen Millimeter zurück. Omega Ruby Arcko est cool, calme et serein. Il ne panique jamais, quelle que soit la situation. Quand un ennemi plus gros que lui lui lance un regard de défi, ce Pokémon reste stoïque et ne cède pas un centimètre de terrain. Omega Ruby Treecko es tranquilo y tiene gran capacidad de autocontrol; no pierde la calma en ninguna situación. Si algún rival se le queda mirando fijamente, le devolverá la mirada sin ceder ni lo más mínimo de su territorio. Omega Ruby Treecko ha classe, è calmo e posato: non si lascia mai prendere dal panico. Quando affronta un nemico più grande di lui, lo fissa dritto negli occhi senza la minima esitazione. Omega Ruby 침착 냉정 어떤 일에도 동요하지 않는다. 체격이 큰 포켓몬이 노려봐도 한 발짝도 물러서지 않고 같이 노려본다. Alpha Sapphire Treecko has small hooks on the bottom of its feet that enable it to scale vertical walls. This Pokémon attacks by slamming foes with its thick tail. Alpha Sapphire Mit den kleinen Haken unter seinen Füßen kann Geckarbor an Wänden hochklettern. Dieses Pokémon greift Feinde an, indem es mit seinem mächtigen Schweif zuschlägt. Alpha Sapphire Arcko est doté de petits crochets sous les pattes, ce qui lui permet de grimper aux murs. Ce Pokémon attaque en frappant ses ennemis avec son épaisse queue. Alpha Sapphire Treecko tiene unos ganchos pequeños en las plantas de los pies con los que puede escalar superficies verticales. Este Pokémon ataca dando un golpetazo con la cola. Alpha Sapphire Treecko è dotato di piccoli uncini sulla pianta delle zampe, che gli consentono di camminare su pareti verticali. Attacca frustando i suoi nemici con la coda grossa e forte. Alpha Sapphire 다리 뒤의 작은 가시를 박아 수직인 벽을 올라갈 수 있다. 굵은 꼬리로 힘껏 쳐서 공격한다. 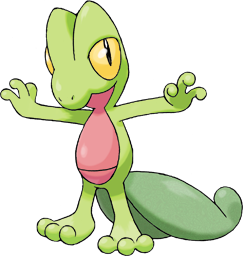 Ruby Treecko has small hooks on the bottom of its feet that enable it to scale vertical walls. This Pokemon attacks by slamming foes with its thick tail. Sapphire TREECKO is cool, calm, and collected - it never panics under any situation. If a bigger foe were to glare at this POKeMON, it would glare right back without conceding an inch of ground. LeafGreen It quickly scales even vertical walls. It senses humidity with its tail to predict the next day's weather. Diamond The soles of its feet are covered by countless tiny spikes, enabling it to walk on walls and ceilings. Pearl The soles of its feet are covered by countless tiny spikes, enabling it to walk on walls and ceilings. Platinum The soles of its feet are covered by countless tiny spikes, enabling it to walk on walls and ceilings. SoulSilver Small hooks on the bottom of its feet catch on walls and ceilings. That is how it can hang from above. Black The soles of its feet are covered by countless tiny spikes, enabling it to walk on walls and ceilings. White The soles of its feet are covered by countless tiny spikes, enabling it to walk on walls and ceilings. White 2 The soles of its feet are covered by countless tiny spikes, enabling it to walk on walls and ceilings.